Stainless steel nuts and bolts,epoxic paint and aluminum body for marine applications. -Exclusive one piece-five blade design for rugedness,balance and low noise. -Low speed startup. -3 phase output. Wind Turbine Base. · Available in all sizes. This wind turbine base is sized to mount a 1", 1-1/4", 1-1/2”, 2” or 2-1/2" pipe, regardless of the schedule number. · 1.380" for base that fits 1" pipe. AIR BreezeBlade Set. Sold as a balanced set of (3) composite blades. 20ma at 48 volts. If you connect them to your battery and get a negative reading, simply swap the wires. 8.5V to 100V DC Digital Blue LED Display. Hook up the leads and you are set. AIR Breeze Stop Switch. Compatible with most marine wind generators. 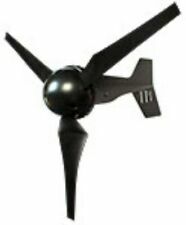 Compatible with AIR Breeze and AIR 40 wind generators. WIND TURBINES, SOLAR PANELS. Heavy duty 1/4" brass lugs, reset-able. Fits new style, quieter, AirBreeze Blades. AIR Breeze Hub. NO ONE CAN BEAT MY SERVICE. WIND TURBINES, SOLAR PANELS. Heavy duty 1/4" brass lugs, resetable. AIR Breeze Nose Cone: White. Fits Air Breeze / Air Breeze Marine. 250 amp DC Circuit breaker. Use for wind turbines or solar panels. Has large 1/4 " brass lugs.